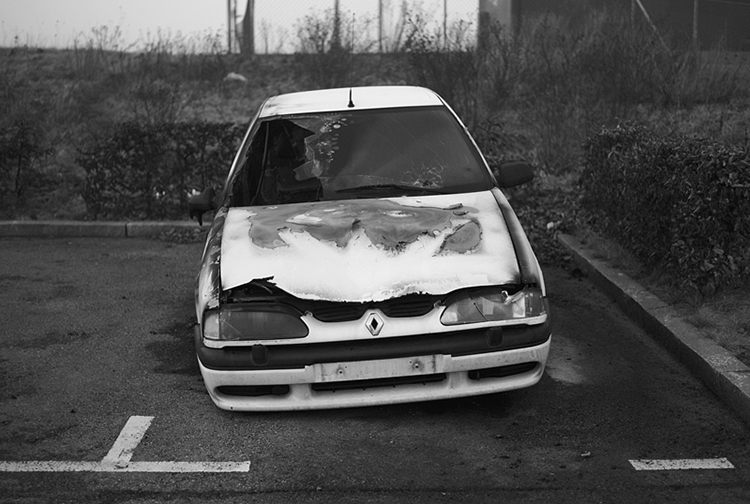 fototazo: The Image: Martin Brink, "Untitled"
The Image: Martin Brink, "Untitled"
Early 2009 I had been driving past this burnt out car and thought I needed to photograph it. It didn't happen though and I didn't go back later for some reason, maybe because I normally doesn't plan photographs, especially not at that time. It was outside the town in an industrial area that I didn't drive through very often. One day a couple of weeks later I was in the same area with a friend who was picking up a new car. While he was finishing the details with the dealer I took a walk on this cold and foggy winter day. During the walk I discovered the car was still there and I started taking photographs of it. I was probably shooting for 5-10 minutes and suddenly a tow truck showed up. It was pure luck and timing that I got to shoot it and this story made this photograph a bit more special for me. It was also quite funny that it was being towed away while my friend was getting a new car. When I was editing I chose this version because I liked the lean to the left and how the whites shone. It was these subtle details that made me select it for "The Daily Round." That and the story.